Frances and I met when we worked at our college newspaper together. We paired up often for stories – she to write and I to photograph. When I met her future husband Richard years later I could not think of a better match. Both Frances and Richard are intelligent and talented writers. And their wedding? It summed up the two of them perfectly. Elements of their love for literature were evident throughout their day. The library sign in table to their bridal party each reading a section from Le Petit Prince are a few examples. The day started with an intense rainstorm. But the clouds parted and the fall sun shone just in time for their first look and portraits. We spent some quality time in Volunteer Park with the awesome and excited bridal party. 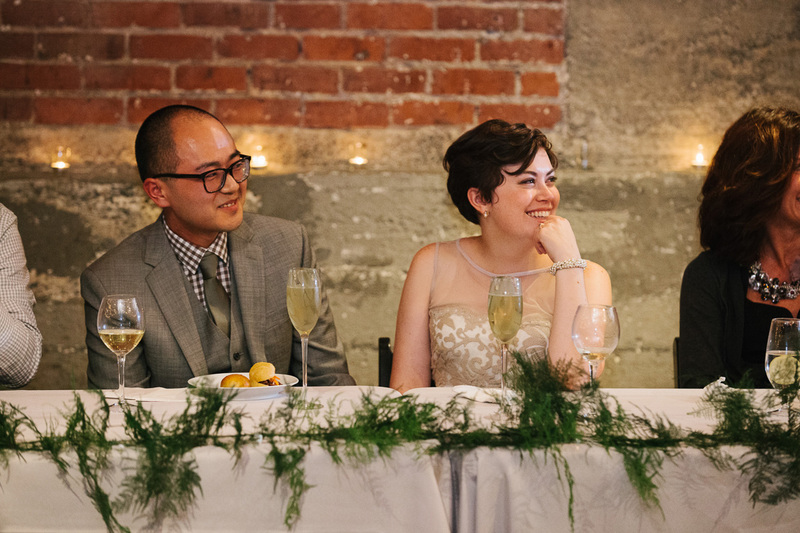 We then headed to urban Capitol Hill venue Melrose Market Studios for the ceremony and reception. The ceremony was befitting of the two writers. It was eloquent, emotional and witty. Following a lively cocktail hour, Frances and Richard’s reception began with thoughtful toasts. The entire bridal party spoke and you could tell how excited they were for Frances and Richard. And the dancing? So outrageous! All the guests were on the floor and Richard’s father did some crazy breakdancing!